Everyone had a different idea of what Food Revolution means to them. To me it means making an effort to make healthful meals most nights for my family. Unfortunately there are a few pesky little details that make that difficult….one is that I don’t get home until 5:30 or 6:00 and Evan likes to eat at around 6:15. So speedy meals are a definite plus. I have found that meal planning really helps keep me on track. Otherwise I am driving home (late as always) trying to come up with something to throw together for dinner. Those days are prime “Just order takeout!” days. I love takeout as much as the next person but it isn’t that healthy and it is expensive! Tip – It is easier to cut the steak into thin slices if it is partially frozen. Slice the steak into thin slices across the grain. Season both sides with Montreal Steak Seasoning or salt & pepper. Add a couple of glugs of oil to a large frying pan or wok and heat over high heat. Once the pan is hot, add the steak to the pan. Cook to the level of doneness you want. I like mine to start to get brown and crisp on the outside. Remove meat to a bowl and keep warm. Add a bit of additional oil to your pan. Add vegetables to the pan. Cook until the vegetables are tender crisp. Add soy sauce, fish sauce and teriyaki sauce to taste. Add meat back to the pan and mix well. This dish is so flexible and packs quite a veggie punch! Remember, you don’t necessarily have to have a recipe to make an awesome dinner. Just look in your pantry & refrigerator and see what you come up with. The more you do it, the more comfortable you will become and you will find yourself reaching for the take out menu less and less. Don’t forget to visit Notes From the Cookie Jar to see everyone else’s Food Revolution Friday posts! I made a beef/broccoli stir fry this week and it was SO GOOD. In fact Jake ate the leftovers today for dinner. You are so right about them being fast and easy-even if you choose to prep the veggies the night before, then it's super fast! Looks yummy! 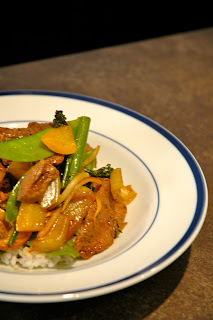 We used to have a stir fry for supper every two weeks at least…….not so much lately:( Yours looks delicious. I will have to try this. They do come together so fast and we do have a 1/2 cow in the deep freeze to use up. As long as it has baby corn in it….Ike will eat it…..so I always keep cans of them in the cupboard. I keep meaning to look up that recipe from Food Revolution last week – the noodles look so good! Love a good stirfry, and yours look perfect for a crazy weeknight.